Curtis Bowman: Book Notes: S. T. Joshi's "The Removal Company"
Book Notes: S. T. Joshi's "The Removal Company"
In an earlier post I mentioned that I had read a mystery story by S. T. Joshi called "Suicide in Brooklyn". Joshi's detective Joe Scintilla has appeared in several books. Since I enjoyed the story, despite the fact that I'm not much of a mystery reader, I went in search of the first book of the series. I got it through interlibrary loan courtesy of my local public library. I read it in a couple of sittings (it's barely 150 pages long), and now I thought that I would post a bit about it. 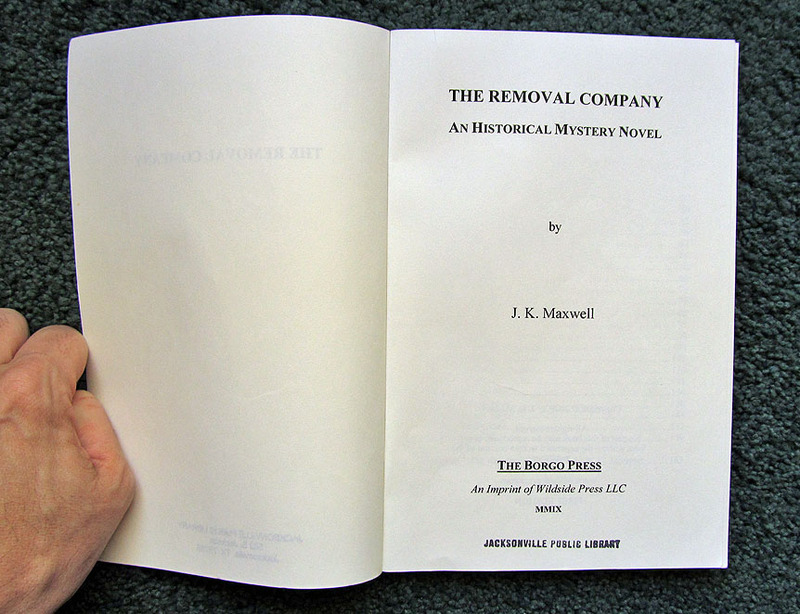 Joshi originally published The Removal Company under the pseudonym J. K. Maxwell. These days the book is available from Wildside Press under Joshi's name. My copy, as you can see in these two photographs, was the original edition. Joe Scintilla is listening to FDR's first inaugural address on March 4, 1933, when his latest client walks through the door with an improbable tale. Arthur Vance is carrying a newspaper wedding announcement from six months earlier stating that an Italian woman named Elena Cavalieri is to marry a New Yorker from a wealthy family. According to Vance, Elena looks just like his wife Katherine, so much so that he insists that she is his wife. The problem is that Katherine committed suicide on September 15, 1931, with the aid of a shadowy organization called The Removal Company. Well, as you can imagine, our hero Joe Scintilla doesn't know what to make of this. But, of course, he goes in search of the truth. After all, a client is a client. As we expect, though, Scintilla comes to believe that there is more than a little to Vance's story. The plot swiftly unfolds in various locations in California, New York, and Italy. 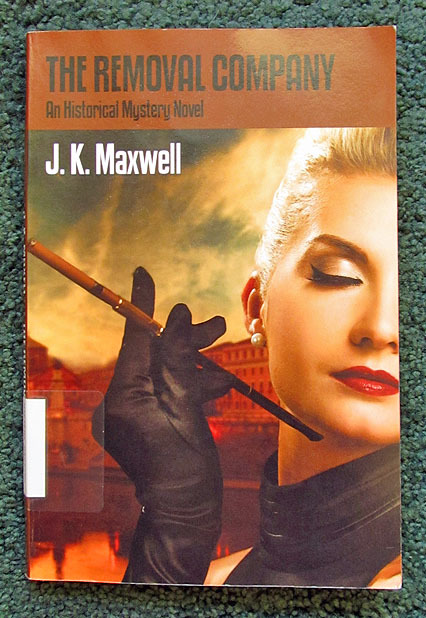 Joshi's prose effectively conveys all the action in the story, including an unusually gentle car chase, and cleverly gets inside of Scintilla's head as he makes his way through the twists and turns of the plot. There isn't much in the way of atmosphere, however. For example, Scintilla's trip to Italy doesn't even take up ten pages. Raymond Chandler would have made a meal of such an opportunity, whereas Joshi sends Scintilla there to check on Elena Cavalieri's background and then just brings him back to the States. So the general lack of atmosphere is a bit disappointing, at least for me. That's what I like best about mysteries. Scintilla was a philosophy student at Johns Hopkins. Since I happen to have been a philosophy student as well, even going so far as to get a Ph.D. in the subject, I would have enjoyed reading more about how having studied philosophy influences Scintilla in his job as a private detective. Anyway, to say more would be to spoil the fun. I enjoyed The Removal Company. It's a good start to the Joe Scintilla series, which I expect to improve as it goes along. I'll eventually read the other volumes and let you know what I think. Update - January 16, 2014: I've uploaded a post about Conspiracy of Silence and Tragedy at Sarsfield Manor, the two latest Joe Scintilla adventures.